The Panasonic Leica DG Summilux 25mm f/1.4 ASPH. is a normal length (50mm full frame equivalent) lens and is the second lens in the Leica/Panasonic collaboration series. Its a moderately priced lens in this line up and is lighter and smaller than some of the newer lenses we are seeing. There is no aperture collar or AF on/off switch. It doesn’t have the heavier metal feel compared to the 12mm f/1.4 or the 42.5mm f/1.2, but it doesn’t feel cheap either. Construction is solid considering its a largely plastic lens housing. 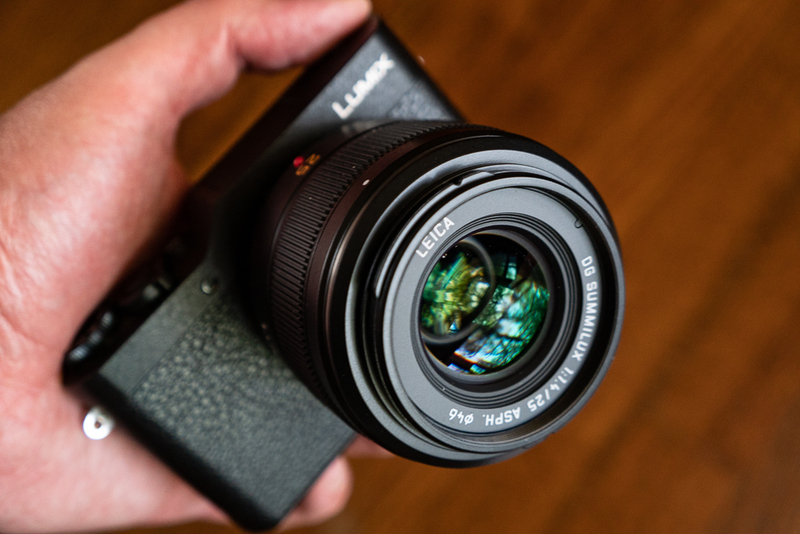 You could easily argue that the lighter weight makes it optimal for an all-day carry around lens with the optical quality you’d expect in the Leica/Panasonic lineup. The Summilux 25mm f/1.4 is an aspherical designed lens that features 9 elements in 7 groups, one ultra-high refractive index element and two aspherical elements. The lens features nano surface coating (for minimizing ghosting and flare) as well as a rounded, 7-blade diaphragm. One of the points I keep reiterating here is the build is nowhere near as heavy-duty feeling as the newer lenses. This is not a bad thing at all – optically the Summilux 25mm f/1.4 is incredible as you would expect. Wide open, you do see vignetting and there is a little bit of sharpness fall off at the edges but this cleans up easily stopping down to f/2.8. The peak aperture for this lens is about f/4. What excites me the most about the Panasonic/Leica lenses is that they are designed not only for low light, but also the depth-of-field rendering is outstanding. This is a big challenge for Micro 4/3 because of the smaller sensor size. However, these lenses have a beautiful, 3D quality to them that I really love. Yes, its not full frame – but you can make gorgeous photographs with these lenses. Sharpness is tight and the bokeh is always beautiful. There’s a wonderful contrast to these images and the look great right off the camera. Even though I don’t get excited about the build quality on the Summilux 25mm f/1.4 – it has the optical rendering hands down. The Summilux is a small and lightweight lens that plays to the strengths of Micro 4/3. As I mentioned previously – this lens is not on the same level of build quality that you’ll find on the more recent Panasonic/Lecia lenses. I don’t think this is a bad thing really – I like the lighter weight and it handles extremely well. One thing I noticed is there is considerable focus breathing with the Summilux 25mm f/1.4. While this is not really an issue for still photography – it can be for video applications when rack focusing. Your composition expands or shrinks as you focus the lens. Other lenses such as the 12mm f/1.4 don’t have any focus breathing issues, but there is a considerable difference in price. Another oddity is the comically large lens hood that comes with the camera. Its looks like Leica were trying to give this an interesting retro look with the squared off mouth, but its strangely large and plastic. I found I didn’t need it at all however. Panasonic’s nano-coating is quite good and flaring/ghosting is not an issue. The biggest frustration for me is the lack of an aperture collar and AF on/off switch. Yes, I can control both of these from the camera, but it frustrates me. I’m used to using these quite frequently with the other Panasonic/Leica lenses. This is an earlier design which might have a lot to do with it and its cheaper so there might have been some price cutting involved. I kind of wish Panasonic would update this with a version 2 at some point with updated ergonomics. But at the same time, this lens is considerably less expensive than the others. It delivers optical image quality on par – its an incredible value. Other thing I like about the lighter weight is when I mount it to a smaller body such as my GX850, it compliments it well. Its a nice little system for going out and shooting all day. Won’t get heavy and the images look incredible. There is no optical image stabilization on the Summilux 25mm f/1.4. If you’re using this on a body that doesn’t have in-body image stabilization, you’ll need to keep your shutter speeds above 1/50 for hand held shooting to avoid blur. Autofocus is fast considering this lens is a few years old. At the time I’m writing this Panasonic have not developed an AF system that’s on par with Canon or Sony which is frustrating. The system is not depth-aware in the same way the PDAF hybrid systems are. Its fast and fairly accurate for most applications. Hunting and seeking in reasonable lighting conditions is minimal. As you can tell by the content I review on this website, I’m still a big fan of Micro 4/3 – mainly due to the lenses from the Panasonic/Leica collaboration. They’re outstanding. The DG Summilux 25mm f/1.4 ASPH. is an incredible value for the money. If you have to cut something, I’d rather it be some of the build quality and convenience than optics any day. The 25mm f/1.4 delivers incredible image quality for a very reasonable price.